Happy Valentine’s Day! Today ranks right after National Chocolate Day on the scale of chocolate yumminess—even if my husband is jonesing for some soft sugar cookies. Being the dear that he is, he even suggested topping them with our favorite glossy, soft, messy chocolate frosting. Aside from the concoction not being straight up chocolate, what’s not to like? And I have a simple, quick cure for that! Whether you’re a boyfriend or girlfriend, husband or wife—or even a good friend—you have plenty of time to whip up this decadent little somethin’ somethin’ for Valentine’s Day. 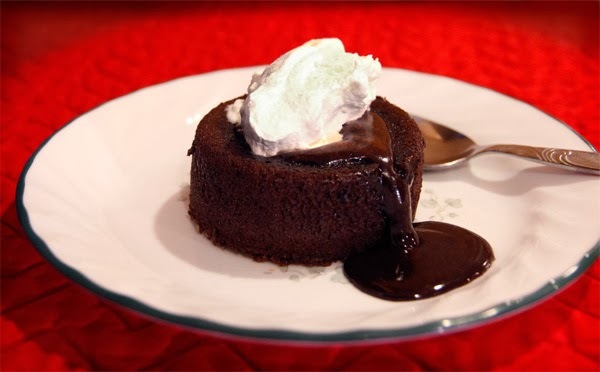 Oozing chocolate with the first bite, this little number is set to impress—and so easy to make from scratch! You don’t have to save it for Valentine’s Day; eet mor choklit! margarine, melted 4 Tbsp. 1/2 cup + 2 Tbsp. 3/4 cup + 2 Tbsp. cocoa 2 Tbsp. 1/4 cup 1/4 cup + 2 Tbsp. powdered sugar 1/2 cup + 1 Tbsp. 1 cup + 2 Tbsp. 1 1/2 cups + 3 Tbsp. flour 3 Tbsp. 6 Tbsp. 1/2 cup + 1 Tbsp. Preheat oven to 425°F. Grease 6-ounce custard cups or soufflé dishes. Place on baking sheet. Whisk cocoa and sugar into melted butter. Add whole eggs and egg yolks. Beat until well blended. Stir in flour. Divide evenly amongst custard cups. Bake 12-14 minutes. Centers should be soft. If removing from custard cup to turn out on plate, run a knife around the sides to loosen. If desired, top with whipped cream. The whole thing is done in 20 minutes, and it is sooooooo yummy! Is chocolate a big part of your Valentine’s Day? What is your favorite, from-scratch decadent chocolate deliciousness?